One of my very favorite words is from Nepal: रङ्गी-चङ्गी; written in letters, raṅgii-caṅgii; and pronounced, rungy-chungy. This fabulous word (which does not have an English equivalent in my opinion) means crazy, multi-colored, splendid, fancy, exciting and fun! It was the design inspiration for one of my newest sculptures, PDX Weather Advisory, created for the Port of Portland which runs the Portland International Airport. 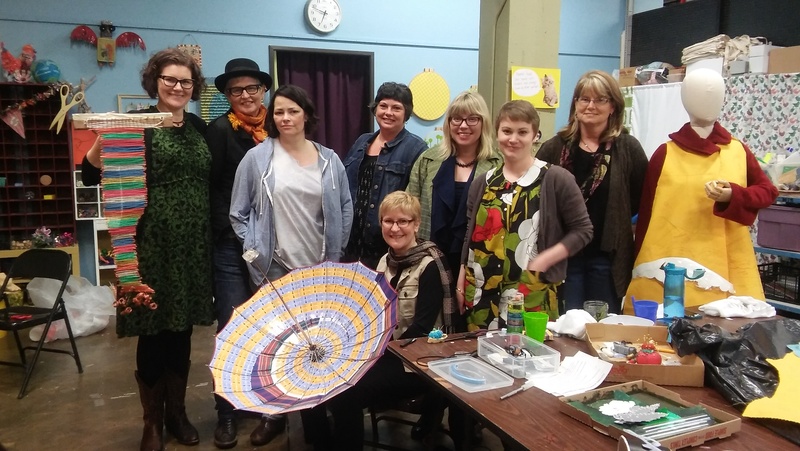 This raṅgii-caṅgii adventure began after listening to a presentation about the PDX Airport’s waste minimization efforts at a meeting about reuse of commercial waste streams. As I listened to Kaileigh Westermann, a Waste Minimization Project Lead from the Port of Portland, I was astounded to learn that the Port has implemented a five-year plan to achieve 90 percent or greater landfill diversion rates at its facilities. Let me repeat that: 90% landfill diversion– that is a TRULY impressive goal! To achieve this, they have an extensive on-site recycling program and provide technical assistance to airport tenants and airlines to reduce waste and recycle a wide variety of materials. Their composting program (unusual for an airport to have!) has diverted over 1,300 tons of food waste from the landfill and they also have a food donation program that has donated 130,000 lbs of food, or 85,000 meals, since its inception in 2013. I also learned that the Port has FOUR other equally impressive sustainability programs! 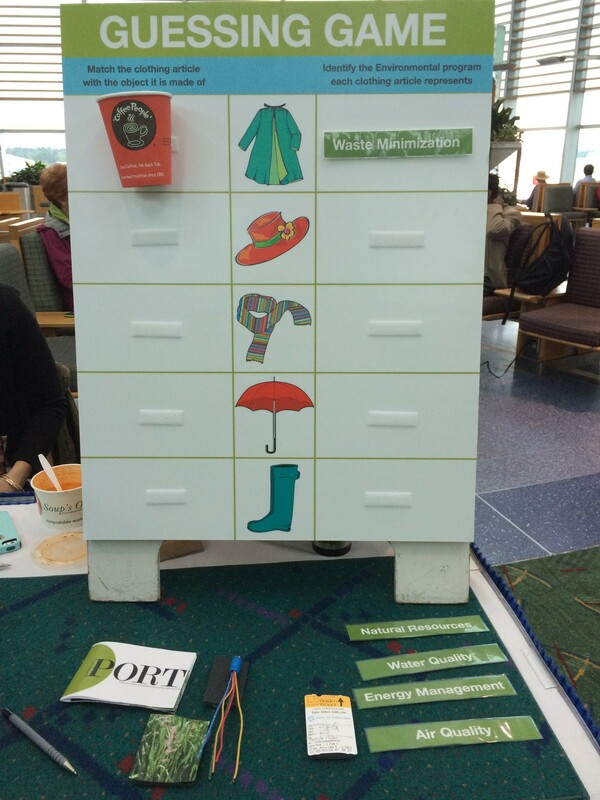 The overall design concept- we settled on a rain gear outfit with five parts (umbrella, hat, scarf, coat and boots) that would each represent one of the Port’s five sustainability programs, and reference Portland’s notoriously wet climate. The message – we met with representatives from each of the five sustainability programs (air, water, energy, natural resources and waste minimization) to discuss what message they wanted to convey and the waste materials they generate that I could use in the garment to tell their story. “Yes, well that is my specialty!” I said with a confident smile, but internally feeling as befuddled as she looked. The word “weather” references the fact that it is rain gear, AND relates to climate change. The word “advisory” in conjunction with weather, refers to a weather term AND implies a warning… which is really the subtext of all my work. 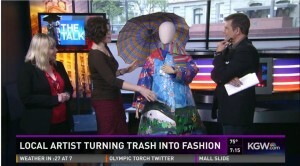 Her nickname is April though because PDX Weather Advisory does not exactly roll off the tongue, and she was finished in the month of April for Earth Day. Yes, April needed to be completed by Earth Day. I stated after Valentine’s Day and it took 440 hours to make the sculpture, it was a pretty raṅgii-caṅgii ride! There is no way I could have done it without the help of more than 35 very generous volunteers: people ranging from Port employees, neighbors I had never met before, mothers of high school classmates, and old friends I had not seen in 30 years helped me finish April by Earth Day. We held work parties at the Port, in a local brew pub, at SCRAP (a local reuse center) and my studio. Thanks to each and every one of you– I see your contributions all over this sculpture and it is part of what makes it so special to me! 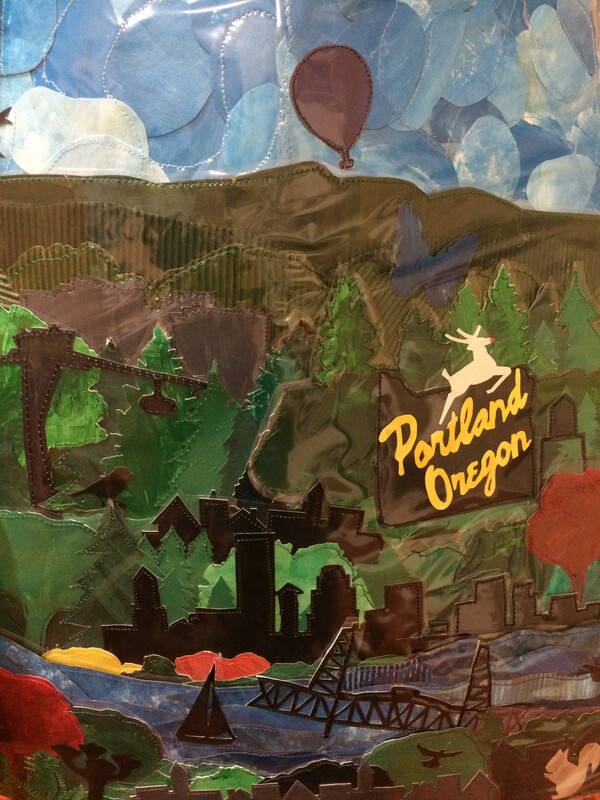 RAINCOAT: Representing the Waste Minimization Program, disposable coffee cups cut into iconic Portland images are sewn to the coat and encourage travelers to reuse items such as coffee cups and water bottles. UMBRELLA: Representing the Air Quality Program, this umbrella is swirling with parking garage tickets, highlighting their program’s reduction in emissions from idling vehicles. HAT: Representing the Natural Resources Program, a hat-collage of insects and wildlife photos cut from old periodicals emphasizes the Port’s various protection programs and mitigation projects. SCARF: Representing the Energy Program, scrap electrical wire is woven into a scarf to highlight the clean energy and energy efficiency programs. BOOTS: Representing the Water Quality Program, these boots feature Reed Canarygrass, an invasive species that threatens wetlands. The Port works to manage this invasive species on mitigation lands, as well as many others, to support healthy watersheds and water quality. Detail of the coat, covered with scrap plastic film to provide protection from the rain! 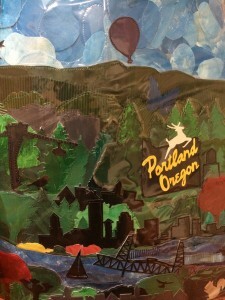 One of the neat things for me about making the raincoat specifically was the connection to Portland in the collaged images. I was born and raised here, but left when I went to college. I returned two years ago and having been away almost 30 years it has been lovely rediscovering my home town. This coat was a surprising way to become reacquainted with the places I knew growing up and that are new to me as well. Cutting out the silhouettes of the Oregon Health and Science buildings called “Pill Hill”, collaging the bumps and shadows on Mt. Hood, and sewing down the Marcum bridge that my sister climbed before it opened in 1970. I found after making this coat that I had a new and surprising intimacy with the details of my beloved City. When April was completed, she was on display in the Airport and now Port staff is taking her to various events around Portland to inform people about their sustainability programs. She will then become part of an exhibition of about six pieces I will have at Portland Fashion Week in September and then join 20 other of my new works in a major yearlong solo exhibit in the Atlanta Airport in 2017/2018! Kaileigh Westermann and the Port’s Corporate Communications, created a fabulous hands-on interactive display to accompany the sculpture. The board has three columns, the first has the materials (attached to Velcro) used to create April; the second has images of the coat, hat, boots, umbrella and scarf; and the third column has the name of each sustainability program on pieces of foam core. 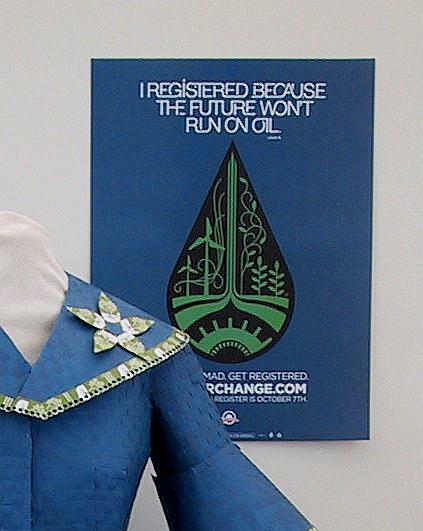 People can then match the material with the piece of clothing and the program it represents. 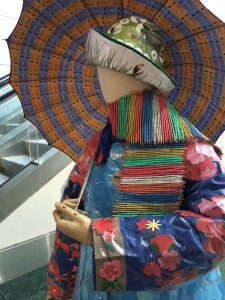 It is a great way of engaging people in learning both about the sculpture as well as the airports sustainability programs. However, the story that PDX Weather Advisory tells is just the tip of the iceberg; the Port has many more inspiring sustainability programs! For example in their headquarters located at the Airport, their waste water is recycled through a “Living Machine” made of plants and underground gravel chambers! Part of what made creating PDX Weather Advisory such a raṅgii-caṅgii experience, was that I had just finished (two days before) another sculpture called “Bella”, and was simultaneously working on a third piece, “Pacifica”, for the Nature Conservancy, also due at the same time. There was literally no way I could have completed these three sculptures in four months if it were not for ALL the people who volunteered their time to help! I want to give a special thanks to Kaileigh for chauffeuring this project through all of the bureaucratic windy roads that needed to be navigated. To Erin, Grace and Lisa also from the Port for your many contributions, and to Stan Jones, Kaileigh’s boss who said “Go for it!” when she came to him with the initial idea. It was great to work with and get to know all of you, thank you for this wonderful opportunity! Click here to watch TV coverage of PDX Weather Advisory! Congratulations, Nancy! Good to know about your new projects. Fabulous as always Nancy! Love to see your successful creations and hear how you’ve involved the community. 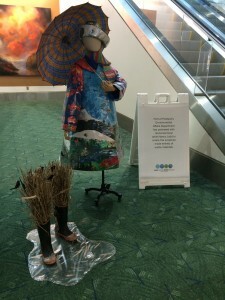 Congratulations, Nancy and the Portland Airport, for figuring out how to recycle materials and creatively document that work. Wish I’d been there to help put it together. We miss you, Nancy. I want you to know that when your Recycle Runway entries show up, I do read them from top to bottom. Your work has always intrigued me. You’re looking great by the way…great TV clip at the end. Love to both you and Nicole!